Suriya had earlier revealed that he is playing ‘Kaappaan’, meaning a protector, to Mohanlal, who is playing the role of a Prime Minister. However, it seems that’s only one of the roles he’s essaying, as one can also see him as a villager complaining about issues and other getups. Mohanlal, who worked with Jr NTR and Vijay in recent years, shares screen space with Suriya too now and the latter wrote he is ‘blessed’ to be working with the Malayalam superstar while sharing the teaser. Tamil New Year is being celebrated on Sunday and Suriya had the best gift for his fans on the occasion as he unveiled the teaser of his next ‘Kaappaan’ also featuring Mohanlal. The teaser features the former in multiple get-ups in an action-packed drama revolving around political issues. Suriya had earlier revealed that he is playing ‘Kaappaan’, meaning a protector, to Mohanlal, who is playing the role of a Prime Minister. However, it seems that’s only one of the roles he’s essaying, as one can also see him as a villager complaining about issues and other getups and is even termed as a ‘terrorist’ as he goes about his mission which involves plants a bomb on a train. 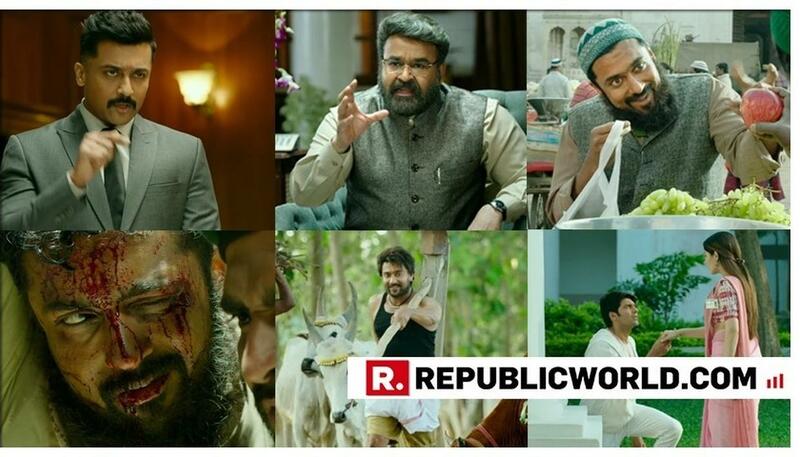 Whatever be the language, Mohanlal looks in fine form like always as he takes a dig at Pakistan. The actor, who worked with Jr NTR and Vijay in recent years, shares screen space with Suriya too now and the latter wrote he is ‘blessed’ to be working with the Malayalam superstar while sharing the teaser. Arya, who tied the knot recently with Sayyeshaa, goes down on one knee to propose her in the movie and they are both in the thick of the proceedings. Like Mohanlal, even Boman Irani seems convincing in his Tamil dialogues. The movie seems like an action-packed movie with the numerous explosions and combat scenes involving guns and knives. ‘Kaappaan’, directed by KV Anand, gears up for release in August this year.